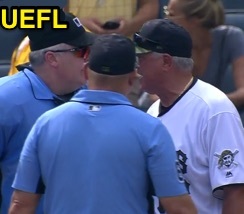 1B Umpire Mark Carlson ejected Pirates Manager Clint Hurdle (Replay Review decision that affirmed HP Umpire Bill Welke's bona fide slide rule violation no-call on force play at home plate; QOCN) in the top of the 8th inning of the Cubs-Pirates game. With none out and the bases loaded, Cubs batter Chris Gimenez hit a 1-0 fastball from Pirates pitcher Kyle Crick on the ground to shortstop Sean Rodriguez, who threw to catcher Elias Diaz to force out Cubs baserunner R3 Anthony Rizzo, as Diaz attempted to throw to first base, resulting in a throwing error that allowed Cubs baserunners R2 Javier Baez and R1 Kyle Schwarber to score as batter-runner Gimenez advanced to second base. Upon Replay Review as the result of a challenge by Pirates Manager Hurdle, HP Umpire Welke's ruling that Cubs runner R3 Rizzo did not violate the slide interference rule was affirmed (call stands). 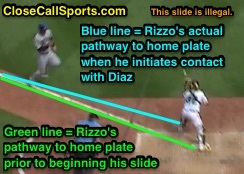 Replays indicate baserunner Rizzo, by virtue of changing his pathway for the purpose of initiating contact with catcher Diaz, did not engage in a bona fide slide, the call was incorrect. * At the time of the ejection, the Cubs were leading, 5-0. The Cubs ultimately won the contest, 7-0. This is Mark Carlson (6)'s first ejection of 2018. Mark Carlson now has -1 points in the UEFL Standings (-1 Prev + 2 MLB - 2 Incorrect-Crewmate = -1). Crew Chief Mark Carlson now has -2 points in Crew Division (-2 Previous + 0 Incorrect Call = -2). Related: MLB Ejection 153 - Mike Everitt (3; Joe Girardi) (8/27/17; another QOCN bona fide slide Replay). 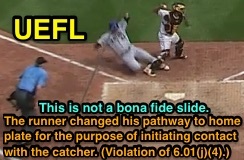 Related: Video Analysis of New Bona Fide Slide FPSR Rule 6.01(j) (3/1/16; primer on this rule). (4) slides within reach of the base without changing his pathway for the purpose of initiating contact with a fielder [NO]. Gil's Call: Replay Review clearly erred here. Gil's Call: In order to adjudicate this play, one must see the entirety of the replay that begins when Rizzo first commenced his run toward home plate—shortly after the shortstop fields the ball. This requires rewinding the tape to far in advance of the clip provided by the Cubs' deficient broadcast. Replays conclusively indicate that Rizzo's pathway to home plate placed him parallel to, and on the foul side of, the third base foul line. When Rizzo began his slide, he vaulted into fair territory and toward the catcher, clearly changing his pathway for the purpose of initiating contact with a fielder. This is textbook slide rule interference and a very concerning missed call by the Replay Official. UIC Welke is 1BL extended for the force, which is fine, and why he might have not seen this in real-time. This needs to be picked up on Replay Review and indicates perhaps that more training is needed or, if baseball wants this slide to stay in the game legally, it requires a revision to the rule. One or the other: under present Rule 6.01(j), this is interference. At the college level, the force play slide rule (NCAA 8-4) makes this really simple ("On any force play, the runner must slide on the ground before the base and in a direct line between the two bases"). Because Rizzo didn't slide directly to the base (the rule also requires his body to fit within the confines of the baseline, which it clearly does not), he and batter Gimenez would be out for FPSR interference under the NCAA code (other runners return to bases of origin). Iso: Rizzo's pathway begins in foul territory. At the high school level, in addition to the requirement that, "on a force play, [a runner] slide in a direct line between bases" (NFHS 8-4-2-b), a plate umpire additionally may wish to consider whether a slide such as Rizzo's qualifies as malicious contact due to intentional excessive force and/or intent to injure, in the runner's attempt to break up a double play. Offensive malicious contact, by rule, is automatically interference. Though I don't believe the contact herein is malicious, it is reckless and/or negligent, and should be called interference, placing out both the runner (out on the force) and batter (out on interference) and requiring the remaining runners return to their bases of origin. *IMPORTANT: This is not a violation of the home plate collision rule for one simple reason: "This Rule 6.01(i)(2) [the home plate collision rule] shall not apply to force plays at home plate." This is the 51st ejection report of the 2018 MLB regular season. This is the 22nd Manager ejection of 2018. This is Pittsburgh's 2nd ejection of 2018, 3rd in the NL Central (CHC, MIL 3; PIT 2; CIN, STL 0). This is Clint Hurdle's 2nd ejection of 2018, 1st since April 26 (Mike Winters; QOC = Y [Out of Base Path]). This is Mark Carlson's first ejection since June 13, 2016 (Robin Ventura; QOC = Y [Balls/Strikes]).